Open and Shut? : Media research analyst at Exane BNP Paribas Sami Kassab on the state of Open Access: Where are we, what still needs to be done? Media research analyst at Exane BNP Paribas Sami Kassab on the state of Open Access: Where are we, what still needs to be done? Sami Kassab is an Executive Director at the investment company Exane BNP Paribas, where he runs the Media Research team covering professional publishing. Amongst the companies Kassab monitors are Reed Elsevier, Thomson Reuters, Informa, John Wiley, Wolters Kluwer, and Pearson. Currently, Kassab is positive about the sector, arguing that scientific publishing offers “best in class defensive growth in a very resilient industry”. Kassab believes that Open Access (OA) is still a marginal activity and in any case poses neither a short-term nor a long-term threat to large scholarly publishers. In fact, he says, it will enable them to monetise more articles than they have been able to monetise historically. Kassab’s views will undoubtedly challenge OA advocates, who have long maintained that Open Access will mean that publishers will play a much smaller role in disseminating research in the future. This, they add, will force them to downsize, and so reduce the financial burden on the research community. Indeed, it was in the expectation that OA will lower the costs of scholarly communication that many people joined the OA movement in the first place — especially librarians, who have long sought relief from the so-called serials crisis (Whereby the cost of serials has consistently outstripped libraries’ ability to pay for all the journals they need). Concomitantly, OA advocates argued that Open Access will inevitably reduce the profits of scholarly publishers, a belief that gained credence from the way in which publishers have persistently lobbied against OA over the past decade or so. But this is no longer the view of Exane BNP Paribas, or of Kassab. Today the investment company is upbeat about the future of large scholarly publishers like Elsevier. Kassab has turned positive on scholarly publishing for two reasons. In any case, says Kassab, there is no discernible future threat from OA either. While anticipating that the author-pays OA model will lead to a decline in per-article prices, Kassab expects this to be compensated for by a rise in the number of papers published. OA advocates would doubtless point out that while these 700,000 papers may be rejected by the first journal to which they are submitted, the overwhelming majority of them nevertheless go on to be published elsewhere — since most if not all papers are eventually published. As such, they would say, these papers are already being monetised under the subscription model. If this is right, it would seem to suggest that OA will reduce publisher revenues, particularly if the price per article is expected to fall from $4,000 to $2,000. However, Kassab’s assumption is that big publishers like Elsevier and Springer are inevitably the first choice for researchers wanting to publish a paper. As such, in a Gold OA environment the lower price-per-article would be compensated for by the fact that these publishers would start publishing papers that historically they would have rejected (papers that today would presumably be published by journals further down the journal hierarchy). If Kassab's analysis is correct, then presumably this is good news for large publishers, but bad news for smaller publishers, who could presumably expect to lose market share to their larger rivals. Economics aside, what did I find particularly noteworthy about Kassab’s answers below? First, I was surprised at his suggestion that the image of publishers has improved rather than (as is widely argued by OA advocates) deteriorated in recent years. In support of this claim Kassab cites the fact that where 34,000 researchers signed the PLOS 2001 petition calling for OA, and six years later (in 2007), 30,000 signed the JISC petition calling on the EC to make publicly-funded research freely available, in 2012 less than 14,000 committed to boycott Elsevier on the Cost of Knowledge website. Third, I was struck that in making the case that OA is only of marginal interest, Kassab cited a 2010 survey of researchers that had concluded that access to research papers is unproblematic (Access vs. Importance). Until it withdrew support for the controversial Research Works Act, Elsevier frequently cited this survey too. In doing so, however, it often did not indicate that it had undertaken the survey itself (via the intermediary organisation the Publishing Research Consortium). Examples of such citations can be found here and here. The 2010 survey is a controversial one, not least because of its claim that 93% of researchers surveyed reported that they were satisfied with access to research information in journal articles. Even more strikingly, it reported that 78% of respondents in Africa find it very or fairly easy to access all the journal content that they need. When they are presented with these findings, researchers tend to greet them with a mixture of anger and scepticism — see this conversation last year for instance. 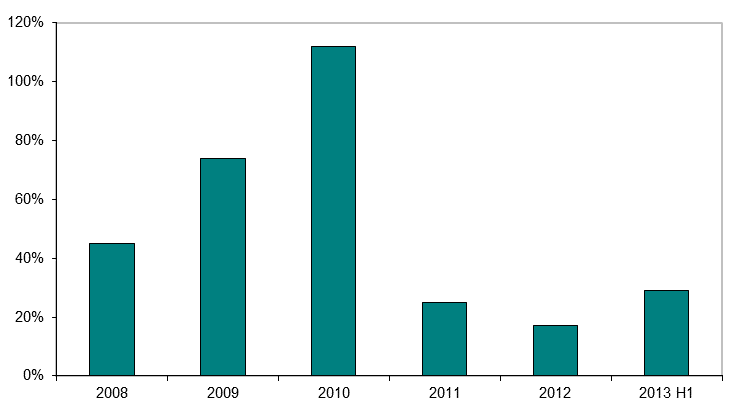 Fourth, in answering a question about the recent recommendation by the UK Business, Innovation & Skills Select Committee that RCUK’s Green OA embargoes should be reduced in length, Kassab provided a graph (see below) showing the article half-life for a number of different disciplines. He then explained, “If the embargo period were to be reduced to 6 months in STEM and 12 months in HASS, the percentage of publishers’ usage covered by the window of exclusivity would be reduced from 50% to around 30%. If that length of embargo were to become the global norm, publishers’ selling proposition would in theory be weakened. In other words, presumably, Kassab is doubtful as to whether the shorter Green embargoes recommended by the BIS Committee would lead to journal cancellations. We could note that publishers predict a somewhat more dramatic impact. Last year, for instance, The Association of Learned, Professional and Society Publishers (ALPSP), along with the Publishers Association, reported the findings of a survey that, they argued, demonstrated that a six-month embargo would cause libraries to cancel 65% of HASS and 44% of STM journal subscriptions. (Although again the survey was somewhat controversial). Finally, I would note that Kassab’s predictions about scholarly publishing and OA would appear to assume that the current journal-based scholarly publishing system — along with pre-publication peer review and obeisance to the Impact Factor — will continue into the future. This is not the view of many OA advocates, especially second-generation advocates like Björn Brembs — who see a very different kind of publishing landscape emerging. But then Kassab’s timeframe is what analysts call a terminal world. As such, their star gazing generally extends no further than ten or twenty years at most, as Kassab notes below. That, of course, is the maximum timeframe that concerns investors. Q: Earlier in this Q&A series publishing consultant Joe Esposito suggested that Open Access will never be more than a niche activity. As he put it, OA will be “a useful, marginal activity that opens up a new class of customers through the author-pays model … OA is marginal in the sense that most research is performed at a small number of institutions. ‘Most’ is not the same thing as ‘all.’ Those institutions subscribe to most (not all) of the relevant materials. So by definition the access granted by OA is marginal to what researchers at the major institutions already have. Nothing wrong with working on the margins, but let’s call it what it is.” Is this a view you share? If not, what are your expectations for OA? A: For the big four STM publishers — Elsevier, Wiley, Springer and Informa’s Taylor & Francis — we estimate that OA revenues account for 1% to 10% of STM journal revenues with an average of around 3%. OA is indeed a marginal activity when it comes to pulishers’ revenues mix. Subscriptions still dominate. We note however that many of them have stepped up investments in that field in recent years (Informa, Wolters Kluwer, Wiley). Amongst large STM publishers, Springer still is the most exposed to that model. Statistics brought forward by publishers showed that over 90% of researchers claimed to have access to the materials they needed. If correct, this number would suggest that OA is marginal to most researchers, particularly at well-funded institutions. Q: There has always been a great deal of discussion (and disagreement) about Green and Gold OA. In light of recent developments (e.g. the OSTP Memorandum, the RCUK OA policy, the European Research Council Guidelines on OA and the new OA policy at the University of California) what roles do you expect Green and Gold OA to play going forward? A: Through our contact with leading OA publishers, we estimate that the pot of money available for funding Gold OA APC is currently growing at 20% p.a. Our tracking of the growth in the number of OA mandates (institutional and funders) registered on ROARMAP shows a similar growth rate (30% in H1 2013 after c.20% in 2012). Consequently, we believe that both Green OA and Gold OA are likely to continue to grow in the foreseeable future. Gold OA principally serves authors — and readers — who immediately benefit from the value-add delivered by an academic journal publisher (peer-review, language editing, formatting, preservation, dissemination, prestige). The fully formatted version of the Gold OA paper is immediately accessible with no embargo periods attached. In a Green OA environment, publishers’ embargo policies or no self-archiving policies imply that authors — and readers — do not always enjoy the immediate benefits of publishers editing and formatting. Green OA therefore serves primarily the purpose of funders and institutions as they can increase their return on investment through that model. Funders and performing-institutions benefit from the increased scientific impact without paying to publish, other than their subscriptions. As the PEER project has shown, readers prefer using the publishers’ fully formatted version of record rather than the stage-two manuscript of Green OA mandates. Hence our view that Green OA principally fits the purpose of funders while Gold OA principally serves the scientists. A point which is further underpinned by the low compliance ratios and even lower levels of un-mandated self-archiving. Q: What about Hybrid OA, which most of those in this Q&A series have expressed some concern about? What role do you expect to see that play going forward? A: As long as publishers commit to their ‘no-double dipping’ policies hybrid OA journals are just one more alternative. Hybrid OA journals enable gold OA authors to have the immediate benefit from the prestige an established journal has acquired over time. At the same time, unlike pure Gold OA journals, they remain available for authors who do not have the funds to pay APCs and prefer to publish in the traditional format. The system however needs to put in place ways to control that subscription prices reflect the non-OA content of such journals. Q: How would you characterise the current state of OA, both locally and internationally? A: Since 2002, OA has made some good progress but still has a long way to go to become the dominant scholarly communication model, if ever. The European Research Council Guidelines on OA were an important albeit symbolic milestone. We estimate that the European Research Council funds less than 3% of the global volume of articles published every year. The White House order is a more meaningful step as around 50% of the $75bn the US spend on basic research every year stems from federal funds. But with less than 20% of global research output in an OA format, there is still a long way to go. A: I think it should focus on providing more substantiated evidence on how society, institutions and most of all authors would benefit from transitioning the scholarly communication model from subscription to OA. Victor Hugo argued that nothing is more powerful than an idea whose time has come. And yet, OA has been around for more than a decade and still lacks any meaningful critical mass. Researchers are reluctant to do the few extra keystrokes that are required for Green OA. High compliance ratio to green OA mandates are not universal. Perhaps, authors are unconvinced by the fundamental merit of the OA model. The same goes for institutions. Elsevier has over 4,000 institutional clients around the globe. Less than 300 institutions have signed OA mandates worldwide. In contrast, MOOCs have taken the higher education world by storm with hundreds of institutions experimenting with MOOCs within a few months. Q: Do you think that OA inevitably leads to conflict and disagreement between publishers and the research community? Certainly in the wake of the failed attempt to get the Research Works Act passed in the US there appears to be growing disenchantment amongst researchers with commercial publishers. Indeed, in the first Q&A in this series, palaeontologist Mike Taylor says that legacy publishers “are not our partners, they're our exploiters”. Is it that researchers, librarians and research funders expect more of publishers than they can reasonably deliver? Is it that the profits of scholarly publishers are, as critics argue, excessively high? Or is there some other reason for this disenchantment? A: In the context of the last 10 or 20 years, we do not believe that ‘there is growing disenchantment amongst researchers with commercial publishers’. 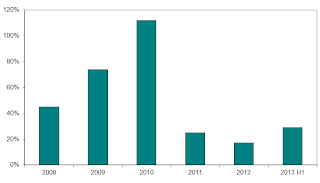 In 2000, the PLOS petition against commercial publishers attracted 35,000 signatures. In 2007, the JISC petition attracted 30,000 signatures. As of today, the ‘Cost of knowledge 2012’ petition attracted less than 14,000. Falling levels of disenchantment with publishers? Although these are separate populations, polled on separate issues, we still believe that the numbers tell us something. At the risk of playing the devil’s advocate, one could say that the image of publishers, especially the largest ones, has actually improved. This view would be consistent with the fact that journal price inflation has come down, that large publishers have invested in new products and technological features (search, visualisation tools, mash-ups, database linking, apps, etc.) and have improved their customer relationship management. STM publishers are a pivotal part of the scholarly communication system and yield power. When this power leads to unsustainable price increases (like in the 90s and during the serials crisis), the backlash is inevitable. On the other hand when price inflation is in line with content and value growth and when cost efficiency gains (through offshoring and technology) are reinvested to drive innovation, an equilibrium between high profit margins and customer satisfaction can be reached. Q: You will perhaps know that Sanford Bernstein analyst Claudio Aspesi believes (see also here and here) that OA poses a significant threat to publishers, especially Elsevier. Do you agree? How would you characterise the attitude to OA amongst most financial investors, and the shareholders of STM publishers? A: We had a similar view between 2002 and 2009 and then changed our opinion. Our proprietary survey of directors of library consortia shows that a vast majority does not expect to reduce spending with Elsevier because of OA in the next five years. We are far from any critical mass that could lead to subscription cancellations. Despite the noise around OA, consortia are still signing long term subscriptions contracts with limited cancellation clauses. At the Frankfurt Book Fair last year, we heard of an Eastern European consortium signing a 7-year deal with a major publisher, more than the usual 3 to 5-year deals. When it comes to valuing publishers’ shares, we have to make an assumption about a so-called terminal world (i.e. how we see the world in 10 or 20 years). 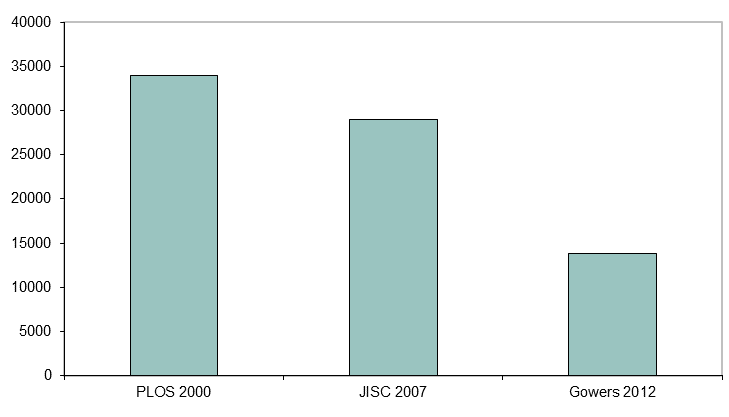 Our working assumption is that the growth in Green OA will ultimately force the scholarly publishing system to revert to the dominant model of the 50s and 60s, i.e. article processing charges, or as we call it today Gold OA. We believe this is likely to drive down the average revenue per article published for journal publishers. However, as the whole industry switches to Gold OA, we believe that large publishers’ rejection rates are likely to come down. In other words, for large publishers such as Elsevier and Springer, we expect an increase in published output to compensate for lower price points. Overall, as things stand, we do not agree that OA poses a significant threat to publishers, in particular not to their share price developments. Since the Budapest Declaration of Open Access in 2002, Reed Elsevier share price has never been as high as now (853p on August 1st, 2013). This share price level has been reached despite the achievement of a major milestone in the OA movement, the White House executive order on Open Access in February 2013. Financial investors and shareholders of STM publishers currently do not discount OA as a major or imminent threat to STM publishers. A: A few years ago, Phil Davis at Cornell produced empirical evidence suggesting that under Gold OA the most productive universities would have to pay more in APC than in subscriptions, while the less productive ones would pay less. As publication primarily benefits the author and its institutions (rather than the reader), this change seems acceptable. We do believe that the cost of publishing research is likely to come down in an OA world. The price points in a subscription model reflect the economics of the model. On the supply side, journals are monopolistic in nature as articles only get published once. On the demand side, users are not the payers. Librarians are caught between a rock (publishers’ price demand) and a hard place (patron’s subscription request). A captive demand and a monopolistic supply most likely lead to high price points. In a Gold OA environment, the model becomes more of an administrative service (managing the peer review, formatting and archiving the content). Such an administrative service is likely to attract more competition and hence result in lower price points. A: We expect more green OA mandates worldwide and further increase in Gold APC payments, but we do not expect OA to reach a tipping point nor trends to differ materially from what they have been historically. We also believe that established STM publishers are likely to launch more Gold OA journals. Publishers increasingly consider the long term risks to their businesses as low but see the opportunity to grow their profits in the short term. Q: Since I emailed my list of questions to you there has been a new development in the OA world, with the publication of the UK House of Commons BIS Committee inquiry into OA. In its report, the BIS Committee calls on the UK government to do a U-turn on its OA policy, and prioritise Green OA rather than Gold (as currently), while at the same time placing an upper limit on embargoes of 6 months for STEM subjects and 12 months for HASS subjects. (Currently 12 months and 24 months). It also recommends that the Government require immediate deposit in repositories (if not immediate OA). In addition, the report says that if the current preference for Gold OA is maintained, “the Government and RCUK should amend their policies so that APCs are only paid to publishers of pure Gold rather than hybrid journals to eliminate the risk of double-dipping”. We do not know whether the UK Government will accept these recommendations, but if it did what impact (if any) would you envisage it having on scholarly publishers, on their profits, and on the development of Open Access? 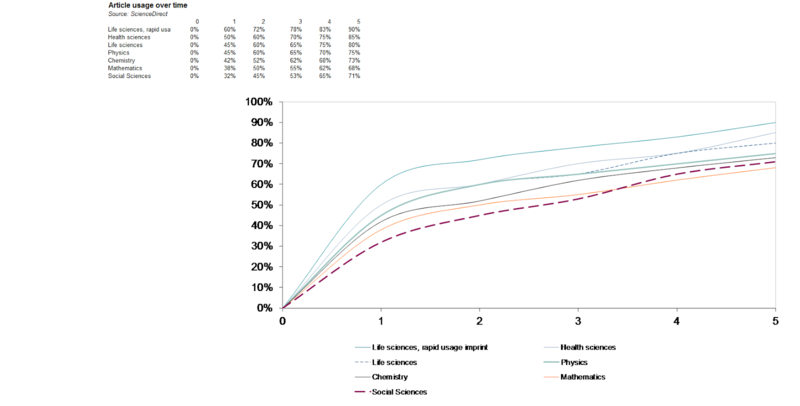 A: The chart below shows the article download curves from Elsevier's ScienceDirect. Given the size of this publisher, we believe it is representative of the whole market. It shows that the half-life in fast moving sciences (life sciences, health sciences) is around 12 months while it is between 24 and 36 months for slower moving sciences like Mathematics or Social Sciences. In other words, in life sciences around 50% of all downloads of a given article happen in the first 12 months of publication. Publishers’ embargo policies are based on the half-life concept. They take the view that a window of exclusivity covering 50% of their usage should be sufficient to protect subscriptions and profits. If the embargo period were to be reduced to 6 months in STEM and 12 months in HASS, the percentage of publishers’ usage covered by the window of exclusivity would be reduced from 50% to around 30%. If that length of embargo were to become the global norm, publishers' selling proposition would in theory be weakened. Yet, it is unclear to me whether subscriptions (and profits) would suffer. For one, a subscription covers the needs of researchers whose downloads are outside the embargo periods as well as those researchers downloading during the embargo period. As subscriptions are not based on the timing of downloads, cancellations would hurt scientists with an urgent need to get access to content. In addition, the UK accounts for c. 6% of global article output and it is questionable whether and how quick other countries, research-funding and research-performing institutions would follow suit. However, we believe this proposition is likely to face some push back from publishers. Sami Kassab is Executive Director at Exane BNP Paribas where he runs the Media Research team. Sami has been covering the professional publishing industry for over 10 including Reed Elsevier, Thomson Reuters, Informa, John Wiley, Wolters Kluwer, Pearson and several other publicly-listed publishers. As an equity analyst, Kassab’s clients include global investment firms who look to buy or sell the shares of listed publishers. Sami has had sell recommendations on Reed Elsevier for most of the 2002 to 2009 period and currently has a Buy rating on the stock. Earlier contributors to this series include palaeontologist Mike Taylor, cognitive scientist Stevan Harnad, former librarian Fred Friend, SPARC director Heather Joseph, publishing consultant Joseph Esposito, de facto leader of the Open Access movement Peter Suber,Open Access Advocacy leader at the Latin American Council on Social Sciences (CLACSO) Dominique Babini, Cameron Neylon, advocacy director for the non-profit OA publisher Public Library of Science, and neurobiologist Björn Brembs. Compliments for an excellent overview. This is recommended reading. At the APE 2013 conference we had vivacious discussions about the sustainablity of public OA funding. In January 2014 our main discussion theme is 'redefining the scientific record'. The quality of OA publishing is of growing concern. I do not like to comment on other research. Since Sami feels free to comment on my research, however, I will make a few points. 1) Some statements are uncontroversial (OA is still a marginal activity today). — we also simulated the possible expansion of the volumes published by Elsevier). Similarly, it is reasonable to assume that most librarians — if asked today — do not expect OA to materially change the amount of money they spend on STM subscriptions. 3) Some would perhaps require more thinking: if revenues per article decline by 50%, just raising the number of articles published may not lead to an equal outcome for publishers. It is true that Elsevier has some fixed costs which are not linked to the volume of articles published, but the vast majority of its journal costs are driven by the volume of articles published. 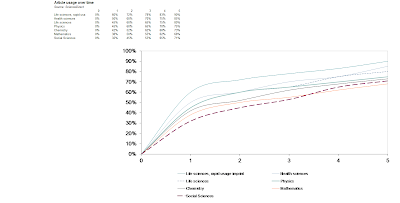 Our calculations show that – in the current model – Elsevier earns about £3,000/article. So, even if Elsevier could earn APCs which are 50% of the revenues per article earned in the current subscription model (and earning APCs of £1,500 across all articles on all journals could prove challenging), and even assuming that Elsevier has a 50% profit margin per article, there would be no profits left. We actually believe margins are lower (in the 40/45% range) and that Elsevier would be able to take some costs out (somewhere between 10 and 15% of its total costs, according to our analysis). Nonetheless, the decline in profitability would be massive, as our simulations show. The real question is not what happens to Elsevier if Gold OA becomes the norm, but whether it happens. Hybrid OA would be an attractive way for the publishers to limit the impact of OA mandates, but it is virtually impossible to prove – over time – that APC funding is being “handed back” to subscribers. Hence, a growing number of funding bodies is indicating that Hybrid OA will not fulfil their mandates. 3) Move to Gold OA, and see their economics deteriorate. Just a minor comment. Page charges were never a major income stream for publishers, contrary to what is claimed. That was my belief too Charles, but I wasn't reporting in the 50s and 60s, so was not in a position to confirm or deny it. It is my understanding, by the way, that some Hybrid journals charge APCs as well as page charges. I think that opinions and analysis in the post and Q&A featuring the views of Sami Kassad leaded by specific interests and not recognizing the core OA issues. The OA model as stated will lead to less profits and less capital turnaround - at least how it works today. This can´t be in the interest of an investment company. 2. The development of scientific publishing through refereed journals has a long history and even the transformation of the historical publisher as an individual into a stock quoted global business has taken 30-40 years. So even in a quicker paced world it may take 10-20 years until OA is the "dominating" mainstream. Additionally we do not know what impact social and mobile web developments will have on scholarly communication in the comming years. 4.The fact that "consortia are still signing long term subscriptions contracts with limited cancellation clauses" are imho not caused by enthusiasm for this type of business model, but by the many forces and stakeholders every consortium is exposed and involved. a. The current state/public funding of science fueling stock based global capital markets and publishers collide with public state and science interests securing investments for public and scientists access to science. b. The growing prices of scholarly journals are not the only burden: The editorial and referee processes today are an equal stress pushed by publishers to scientists. There is a growing frustration of scientists about the whole scientific publishing process seeking quick and unhampered scientific communication.